Hugh Donell Green (born July 27, 1959) is a former professional American football player who was a linebacker in the National Football League (NFL) for eleven seasons during the 1980s and 1990s. He played college football for the University of Pittsburgh, and was recognized as a three-time consensus All-American. 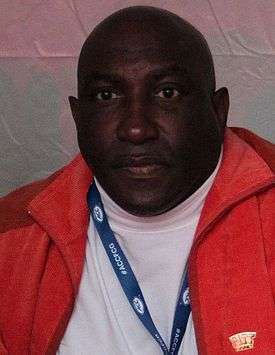 Green was selected in the first round of the 1981 NFL Draft, and played professionally for the Tampa Bay Buccaneers and the Miami Dolphins of the NFL. Green was born in Natchez, Mississippi. He attended North Natchez High School. Green attended the University of Pittsburgh, where he played defensive end for the University of Pittsburgh Panthers from 1977 to 1980. He was a three-time consensus first-team All-American (1978, 1979, 1980) and a second-team All-America selection as a freshman in 1977. He was a consensus four-time All-East selection as well. In the 4 years Green was playing the Pittsburgh Panthers complied a 39–8–1 record, winning three bowl games en route (two Gator Bowls and one Fiesta Bowl). His No. 99 jersey was retired at halftime of his final home game in the 1980 season. After the season he played in both the Hula Bowl and Japan Bowl All-star games. Green left the university with 460 tackles and 53 career sacks in his college career. According to USC and Tampa Bay Buccaneers coach John McKay, "Hugh Green is the most productive player at his position I have ever seen in college". The table is a year-by-year showing of Green's defensive statistics. In 1980, Green won the Walter Camp Award, the Maxwell Award, the Lombardi Award and was the Sporting News Player of the Year, the UPI Player of the Year and finished second in the Heisman Trophy balloting, losing to running back George Rogers of the University of South Carolina. Green's second-place finish in the voting was the best a defensive specialist had ever attained until 1997, when Charles Woodson won the award. Green was selected to the College Football Hall of Fame in 1996 and was named the fifth greatest college football player of All-Time by collegefootballnews.com. He was named to the all-time All-American team compiled by The Sporting News in 1983. In 2007, Green was ranked No. 14 on ESPN's Top 25 Players In College Football History list. He was also named to Sports Illustrated's College Football All-Century team in 1999. Green was selected as the seventh overall pick of the first round by the Buccaneers in the 1981 NFL Draft. He was a 1982 All-Pro and 1983 All-Pro and was elected to the Pro Bowl twice in his career, in 1982 and 1983. Later in his career he suffered several injuries, including a car accident in the middle of the 1984 season for a fracture near the eye. He was traded to the Miami Dolphins in the middle of the 1985 season. In the 1985 season he was on to a career high in sacks and ended the season getting 7.5 while playing all 16 games despite the mid-season trade. In Miami, Green played six more solid seasons before retiring. He was a member of Don Shula's teams which were often playoff contenders and Green was a starter on those teams, racking up 7.5 sacks in 1989, to tie a career high, for example. ↑ SI.com Retrieved March 21, 2009.